The Trinity College harp has had two major rebuilds since it has been exhibited at Trinity College; each rebuild has neatened up the harp for display but has removed or obscured some interesting features. 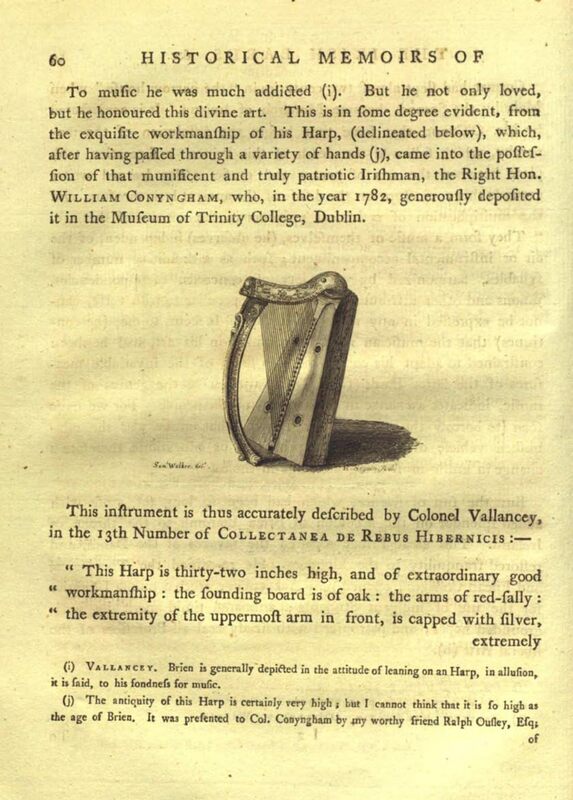 The earliest description of the Trinity College harp I have found is a letter written by Ralph Ouseley in 17831, a year or two after he had given the harp to William Conyngham who presented it to Trinity College. 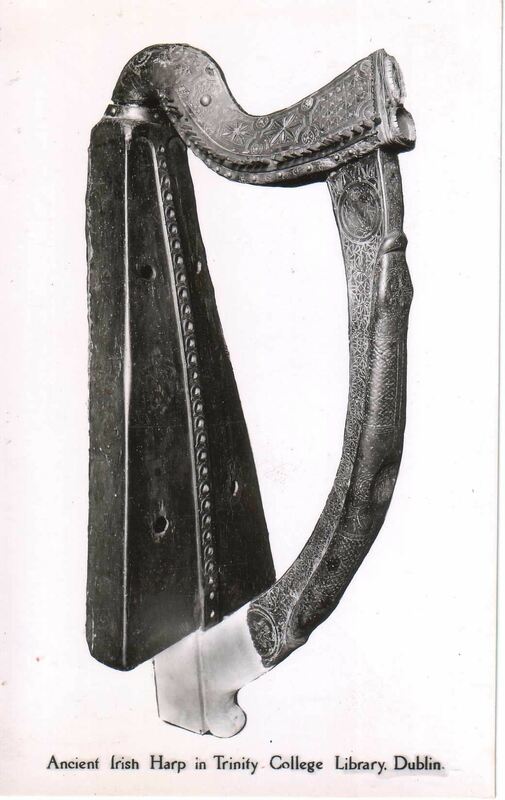 Ousley says that when the harp was acquired by Councellor Macnamara, in about 1756, it had on it silver strings as well as “some more ornaments of plate than are now to be seen”. He says that these strings and ornaments “were stolen or destroyed by servants or idle people fiddling” with them. 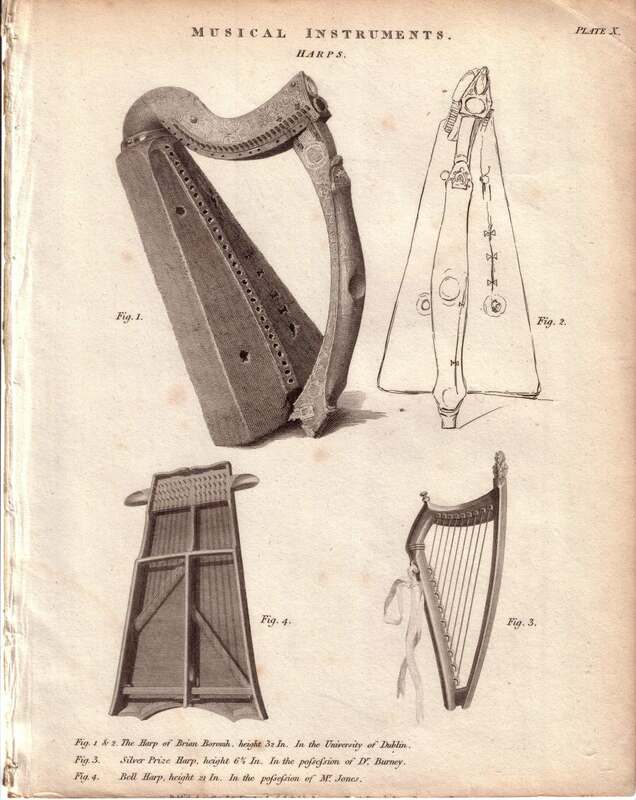 The earliest illustrations of the harp I have found so far are both from 1786. An engraving (mirror image) was published in Vallancey’s Collecteana Rebus Hibernicis2, and a reversed copy (the right way round) in Walker’s Irish Bards3. This was only four years after the harp was donated to Trinity College. Walker quotes Vallancey’s description of the harp, describing the soundboard as oak, the “arms” of willow, the silver end cap, the silver badge on the upper fish head, gilt brass string shoes, and the broken and rotten foot. Vallencey’s illustration is reprinted in the 1789 edition of Britannia4. The earliest detailed evidence of the harp’s state is the 1808 Rees engraving5 which shows a number of interesting features. The bottom of the soundbox and the bottom of the pillar are very eaten away and rotten, and a metal strap joins these two parts. There are also metal straps joining the neck and pillar, and a metal collar round the top of the box. (none of these metal straps is extant today). A large crack is visible on the left face of the soundboard, repaired with butterfly cleats; there is a big crack similarly repaired in the pillar as well. 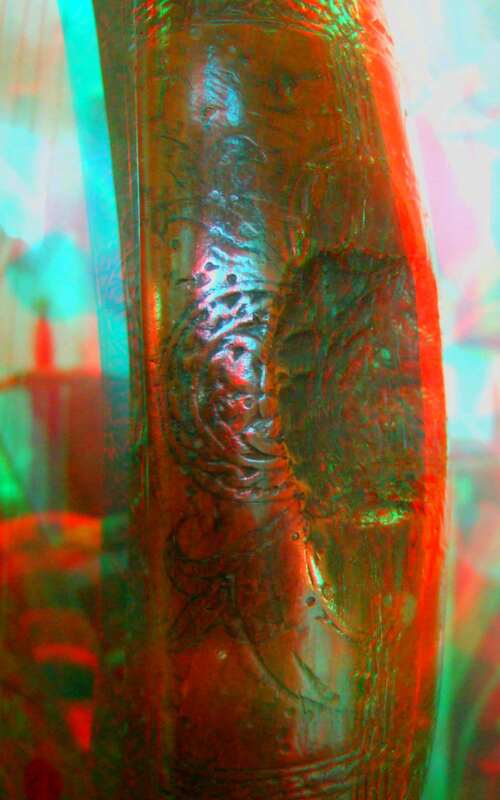 Also visible in this engraving is the badge on the forepillar. The string shoes appear to be missing in this engraving, though they are described and illustrated by Walker in 1786, and are shown in the 1789 Britannia, as well as in Bunting 1840. A very crude and reversed woodcut in the Dublin Penny Journal, 18326, nonetheless shows three numbered points described in the text. The first two are the iron straps at the pillar-neck joint, and the “brass” strap at the pillar-box joint. The third is a “piece of paper” fixed to the soundbox to the right side of the string band in the centre. I wonder if this was some kind of label; I see no trace of it on the other engravings nor mention of it in other descriptions. Edward Bunting’s engraving in 18407 shows the harp in a similar state to the Rees 1808, though the pillar-box strap is no longer visible (or is not drawn in - Bunting’s drawing is less accurate and detailed than Rees’s). Some time in the later 19th century the harp was rebuilt and repaired. The metal straps were removed, leaving only the metal collar round the top of the box. To join the rotten and missing elements of the box and pillar at the base, a new projecting block and pillar base was made from white plaster compound. You can see this in the old photo postcard illustrated here. Note that the forepillar badge is now missing. Note also the 30 tuning pins. The original number of string shoes is unknown, due to damage to the box. In the early 20th century, the Trinity College harp was adopted as the national symbol of Ireland8. The depictions of it used to this day on national heraldry, Euro coins and also on the Guinness beer logo all show it in this state, with the curious plaster scroll at the base of the pillar. 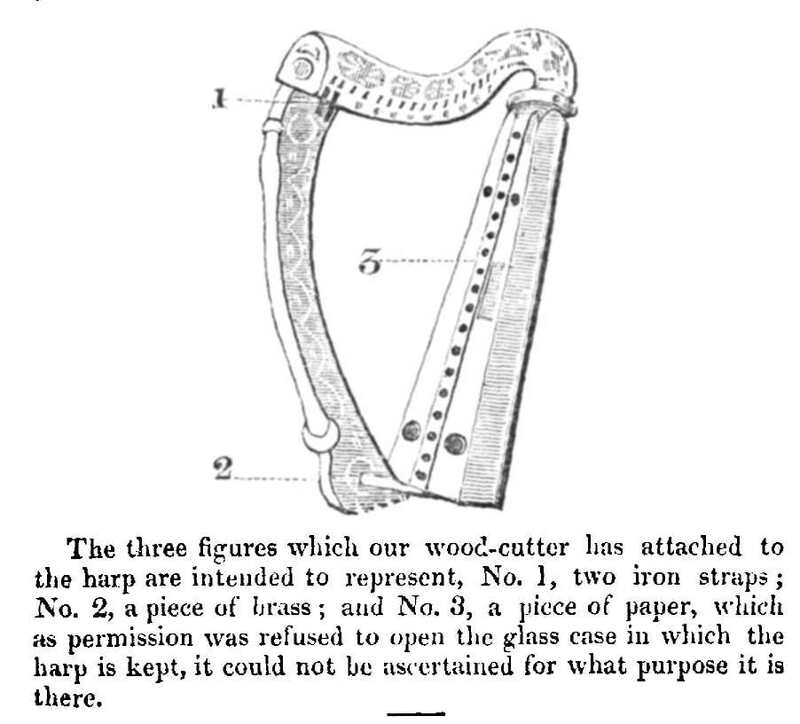 Robert Bruce Armstrong published photos and details of the harp in 19049, and he included pictures of it in this state as well as his own reconstructions of how he thought it ought to look. His reconstructions are not quite accurate. In 1961 the harp was in an exhibition in London10, and while it was there it was dismantled, X-rayed, and reconstructed by the British Museum, into the shape it has nowadays, closer to an original medieval form. Brass strings were put onto the harp, but rather than being a cosmetic stringing (as on other old instruments), Joan Rimmer brought some of the strings up to pitch, and Mary Rowland experimented with playing the instrument. Other things that were done in 1961 as part of this extensive rebuilding were that the 30th pin in the bass was removed, and the pin-hole blocked with a silver stud, and the soundbox was restored with only 29 shoes; and the metal hoop like a collar at the treble end of the soundbox was apparently removed, and the seating filled in with resin or putty. It appears that the work done in 1961 was never published by the British Museum, though there are unpublished internal reports that describe some of the work. First published here June 2010, last updated October 2015.